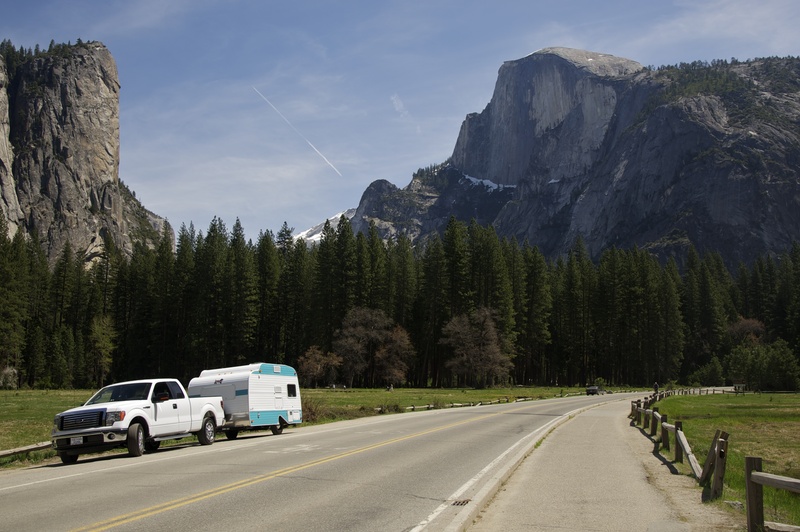 Now that we have a trailer, Dave is eager to revive the family tradition of camping in Yosemite. 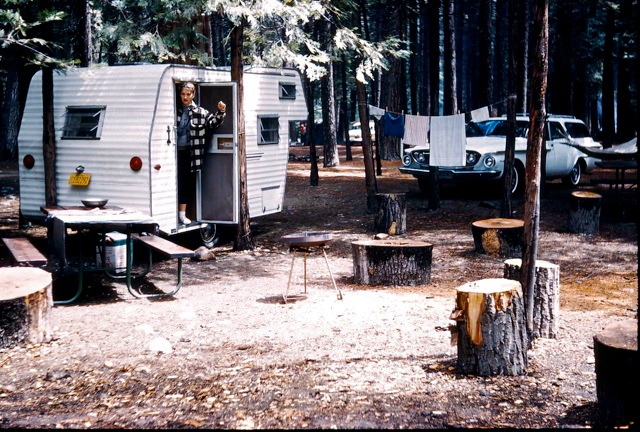 He searches online for available campsites—a bit like hunting for hidden treasure, or in this case, cancelled reservations—and finds two consecutive mid-week nights in the Upper Pines campground. As our departure date nears, we grow increasingly uneasy about the suitability of our Nissan X-Terra as tow vehicle. 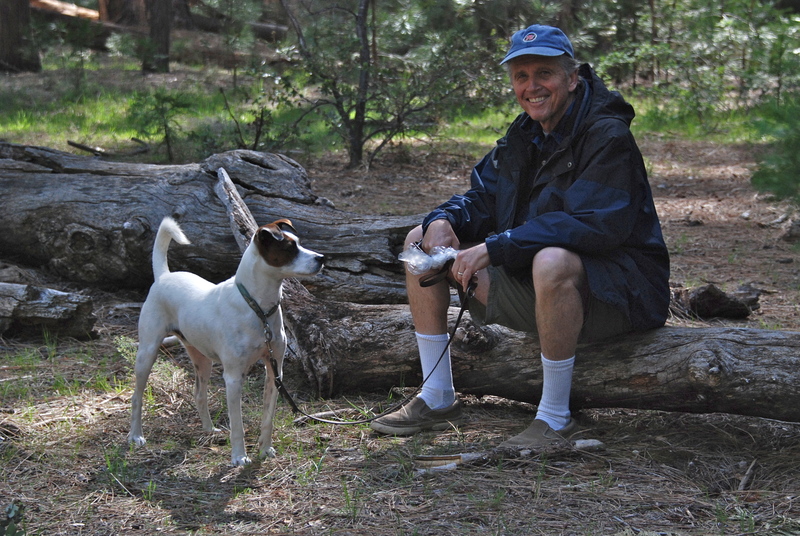 Dave recalls a nerve-wracking drive to Yosemite in the early sixties, when his dad rented a small travel trailer and pulled it behind their 1962 Dodge Dart. As they navigated the narrow, curving road into the park, Dave feared at any moment he’d hear metal scraping rock as the trailer sideswiped the stone guardrail, or metal tearing into metal as they collided with an oncoming car. Neither catastrophe occurred. But the indelible imprint of childhood terror plays a role in our decision to trade in the X-Terra for a Ford F-150 truck. We pack up the night before so we can get an early start, are delayed in the morning by technical difficulties unworthy of explanation here, and end up hitting the road a couple of hours later than planned. No matter. What’s important is that the new Ford proves eminently suitable as tow vehicle: no longer does the trailer wag the truck, we aren’t worried the engine will overheat, and—bonus—Basil can ride up front on the bench seat without squishing me under thirty-five pounds of terrier hound. 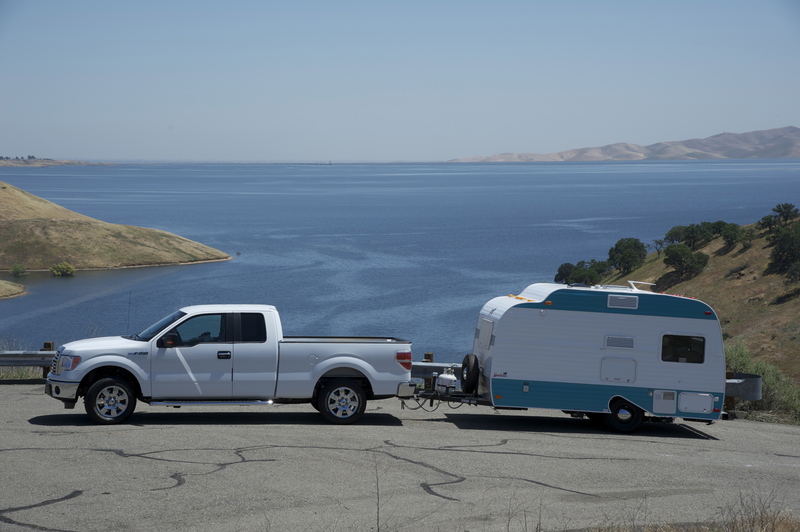 At lunchtime, we pull off the highway next to the San Luis reservoir and make sandwiches in the trailer. Instead of Target’s red and white logo—like the last trip—we gaze at an immense cache of blue water spreading across a hollow of ochre-dry grassland. Our journey continues across the vast (very vast) and flat (very flat) San Joaquin Valley. Basil reclines on the seat between us, his head resting on my lap like a velvet paperweight. As we approach the foothill town of Mariposa, the landscape begins to dip and roll. Spring pastures burn from green to gold, lupine and poppies gather in shallow pockets, and clumps of lichen-covered rock jut from the ground like giant’s teeth. In the distance, a suggestion of our destination: the dim outline of snow-topped peaks. “Here we go,” says Dave. 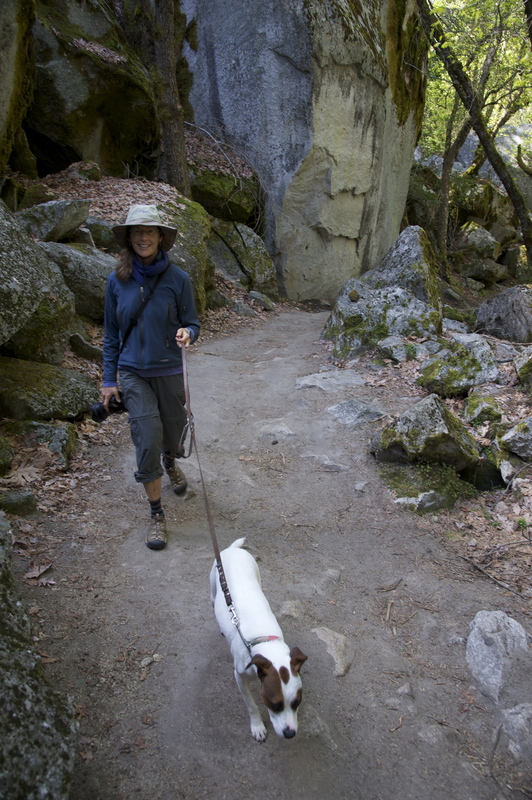 We climb to Mid-Pines, and then wind our way down the steep grade to the Merced River. I’m glad of the sturdy Ford, and glad I’m not the one driving. At the park entrance, a khaki-clad ranger leans close to the truck window and starts explaining how to find the campground. Dave smiles and confirms he knows the way. We squeak through Arch Rock, crawl down the final descent, and then we are in the valley. Waterfalls seem to tumble from every cliff and fissure. 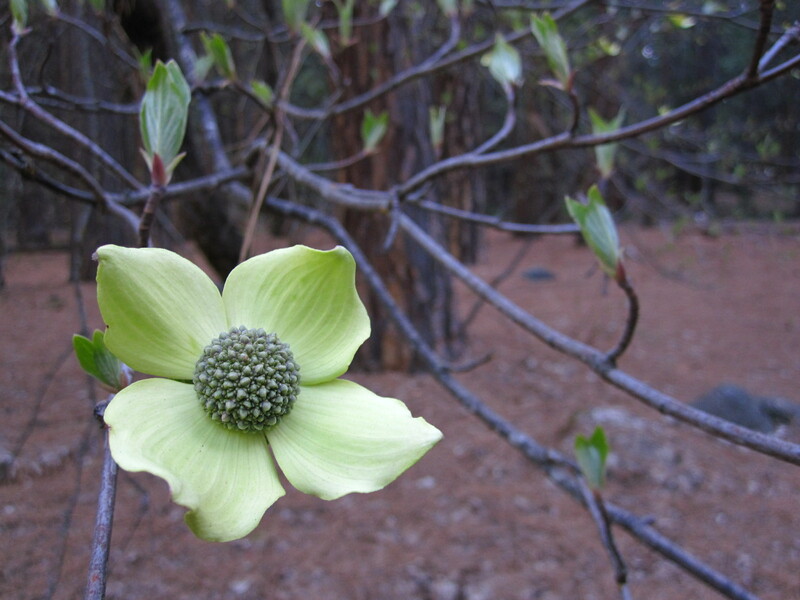 Chartreuse buds illuminate filigree branches, and dogwood blossoms open to the sky. It’s easy to see why the Indians called this place sacred. Dave cruises at a sedate pace through Upper Pines campground, past a hodge-podge of tents, motor homes, and a panel truck filled with camping gear for a group of teenage kids. Our site perches on the outermost loop, at the edge of a forest glen. We are enchanted. Rust-colored pine needles coat the spongy ground, and a seasonal stream rustles past, cascading over rocks and branches with a sound like a contented sigh. Half Dome towers overhead, watching over fortunate pilgrims who sleep here. The evening is mild, and we eat dinner outside: turkey burgers spiced with shallots and herbs accompanied by sautéed asparagus, carrots and broccoli rabe. In the site next to ours, four cheerful young men sit around a blazing fire. Two of them are identical twins, celebrating their 30th birthday(s). They have brought a boom box, and are playing Eagles songs from the 70’s. “Is the music bothering you?” they ask. “No; no,” Dave assures them. “I like it.” (The Eagles are a favorite band since college.) After dinner, one of the twins, baseball cap worn backwards, walks over and hands us a paper plate with a generous slice of birthday cheesecake. “Sure the music’s not too loud?” he asks again. No worries. We remember what it’s like to turn thirty. Besides, the party mood is contagious. In the morning, we wake to the sound of water flowing in our little brook, and sunlight reflecting off the granite wall of Glacier Point. We plan an early hike to Mirror Lake. The air is cool in the pines on the valley floor, and the Girl Scout in me layers on wool hat, long pants, fleece and polypropylene. Dave is similarly prepared. Over-prepared, it turns out, because as soon as we start walking, we begin to overheat. “We have to remember to start out cold,” Dave says. As if to illustrate this precept, an incongruous apparition appears on the trail: a plump blonde woman wearing a skin-tight mini skirt, spaghetti-strap top and knee-high rubber boots. She looks completely out of place, but certainly not overheated, and for one cognitively dissonant moment, I covet her outfit. Well, not the boots. We return to camp, and all is quiet. After a lunch of open-faced sandwiches (sautéed greens, slices of avocado, Emmentaler and tomato on dark rye bread) we arrange chairs at the edge of our snow-fed creek. Basil naps at our feet. 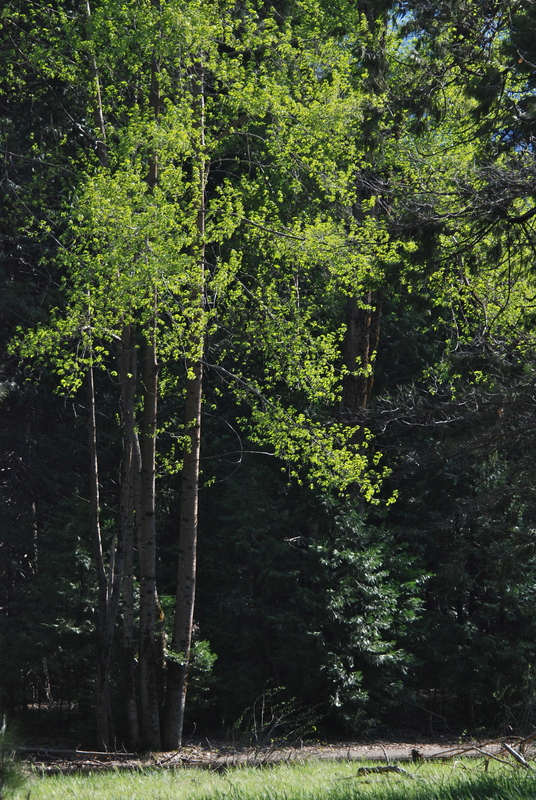 We watch patterns of light shift across the forest floor. Two ducks float past. They dive to search for food, then surface and drift further downstream. Sitting here, you’d never know the valley is full of people. 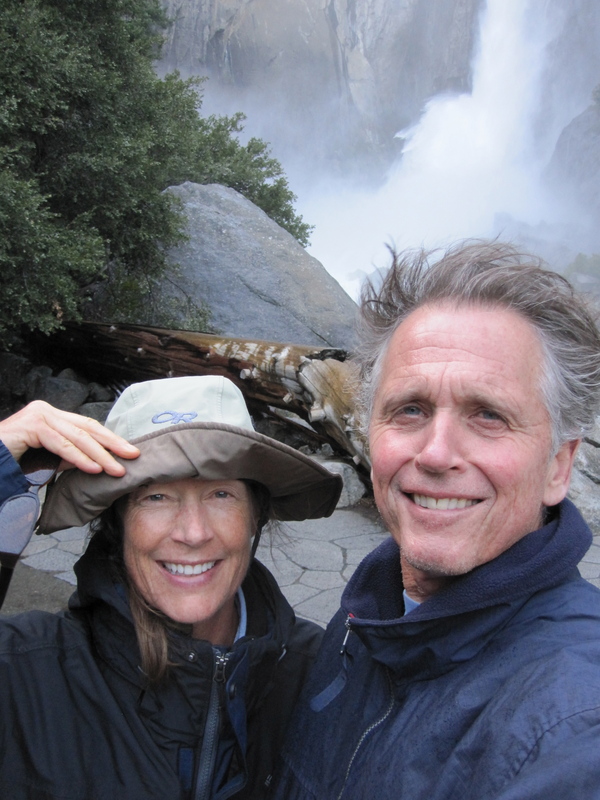 I’m accustomed to seeing as many tourists in Yosemite as awe-inspiring views, but this trip we’ve stayed away from high-traffic areas, and since we’ve brought our own food and lodging, there’s no need to visit the teeming hotels and restaurants. I am experiencing the park in a new way; enjoying the serenity of self-sufficiency. I wish we could stay longer. As if reading my mind, Dave proposes we stay another night, if we can find an available campsite. A quest begins. Fifteen minutes later, we are sitting in the truck in the Lodge parking lot, trolling the website on Dave’s laptop. No vacancies. At least not right now. Maybe after a walk to Yosemite Falls. Eagle Scout Dave pulls on a waterproof jacket and hands me a raincoat, even though skies are clear and the day is warm. This time preparedness pays off, for at the base of the falls, the explosive force of the water creates a localized storm of icy, wind-driven mist. In the evening, wood smoke wreathes the trees. Dave grills steaks while I roast fingerling potatoes and toss a green salad. We sip glasses of Yellowtail Shiraz and eat outside at the picnic table, at home and secluded in our personal space, yet in relative proximity to hundreds of other campers doing the same. It’s more peaceful than I might’ve predicted. There’s a comforting spirit of “circling the wagons,” and although no physical barriers separate individual sites, unwritten protocol seems to decree that everyone take pains not to tromp though anyone else’s domain or otherwise invade anyone else’s privacy. The next morning, we walk to the ranger’s kiosk and inquire about the availability of “no-show” campsites. A grizzled, jug-eared gent dissuades us. Sign-ups started at 8:30 a.m. (an hour ago), the verdict won’t be announced until 3 p.m. (we still have to vacate our site by noon), and some of the sites are closed due to flooding, thus lessening our chances. The best thing to do is to make the most of the time we have. Good advice any time. On the bridge over the Merced River, we pause to admire the volume of water passing under our feet. 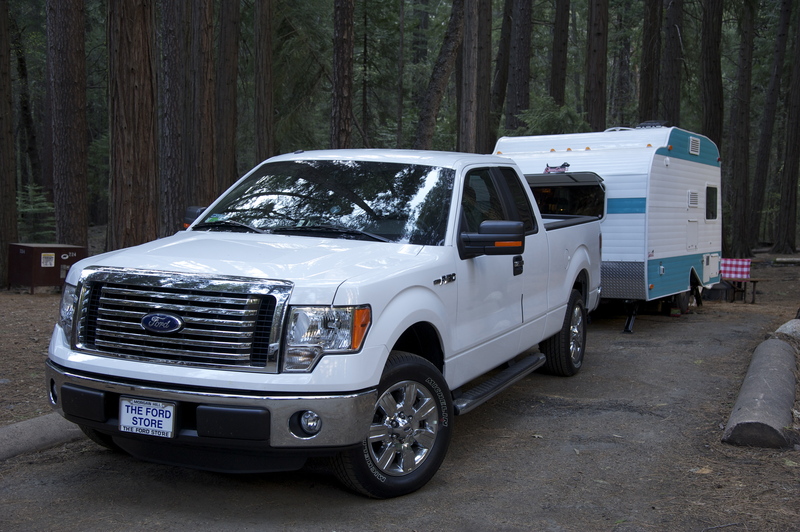 In Lower Pines campground—you guessed it—we scout appetizing sites for future reference. 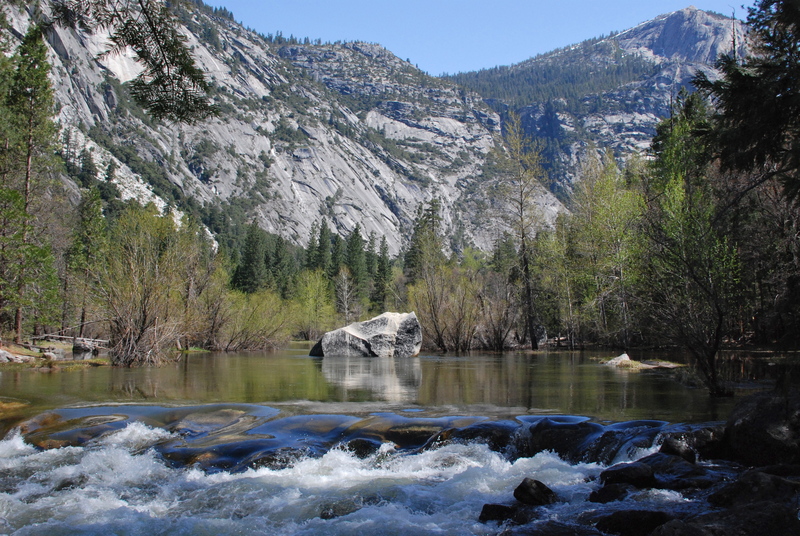 Across the bright ribbon of Tenaya Creek, we skirt the valley on an oak and cedar-shaded trail. Basil tries to chase about fifty squirrels, but is thwarted by his leash. Water spills across our path under the Royal Arches, and the three of us leap from rock to rock. 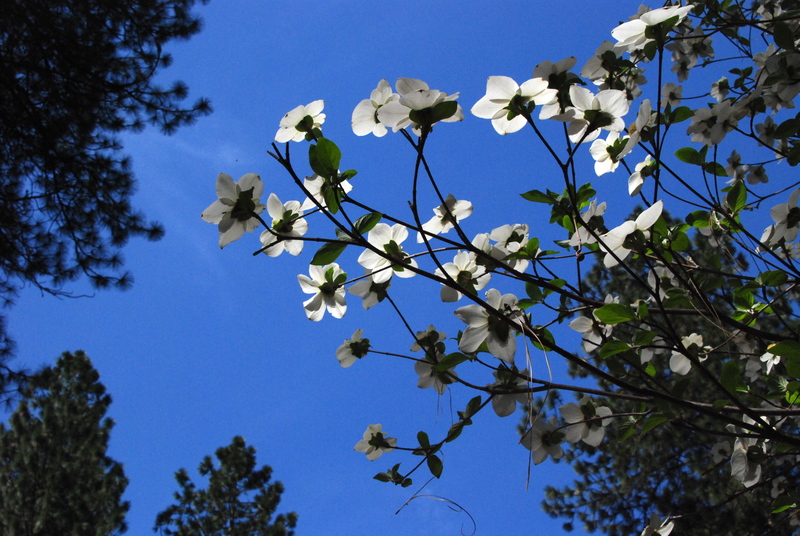 Near the Ahwahnee Hotel, we photograph a magnificent grove of dogwood trees in full flower. The only other soul we meet is a squawking Stellar Jay, and we feel as if we have the valley to ourselves. We will return in September, and have already extended our campground reservation from three nights to five. Such a lovely recount of a lovely sounding journey. Your meals are quite impressive. What happened to frank-n-beans? S’mores? Remind me to bring y’all along when we try camping again. Love to you both!